Claude Steele reports stunningly clear empirical psychological evidence that when Black students believe they are being judged as members of a stereotyped group rather than as individuals, they do worse on tests. He finds the mechanism, which he calls “stereotype threat,” to be a quite general one, affecting women’s performance in mathematics, for instance, where stereotypes about gender operate. He analyzes the subtle psychology of stereotype threat and reflects on the broad implications of his research for education, suggesting techniques-based again on evidence from controlled psychological experiments-that teachers and mentors and schools can use to counter stereotype threat’s powerful effect. 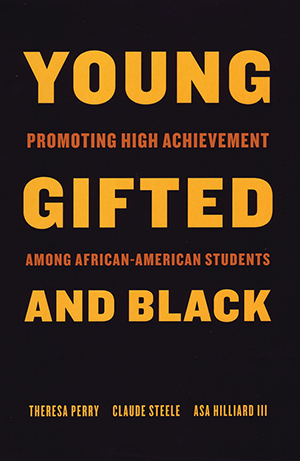 Asa Hilliard’s ends essay, against a variety of false theories and misguided views of African American achievement, and focuses on actual schools and programs and teachers around the country that allow African-American students achieve at high levels, describing what they are like and what makes them work.